iSpring is the breakthrough skincare product that can instantly penetrate into the skin to achieve deep hydration and expedites cutaneous microcirculation and metabolism. It enhances the absorbability and penetrability of skin and optimizes the benefits of the skincare products, leaving your skin soft and radiant. iSpring accelerates repair, healing and regeneration of skin cells. This miracle mist helps fight aging by reducing the appearance of wrinkles and fine lines. By improving cutaneous penetration of active ingredients in skincare products, their effectiveness will be optimized, so you will have a softer, smoother, more luminous and youthful complexion. 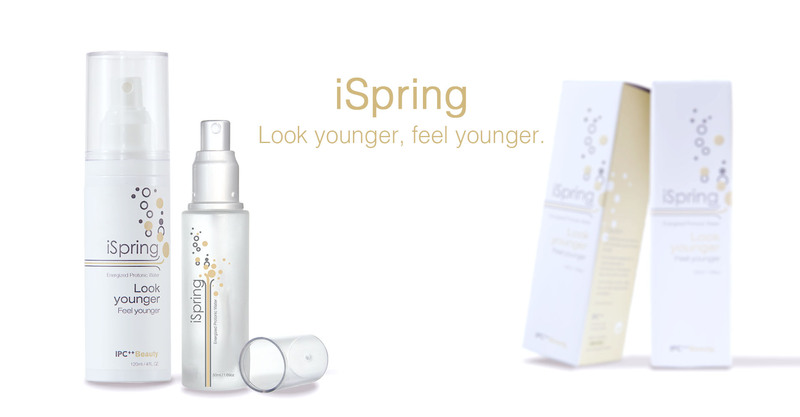 iSpring is suitable for all ages and and skin types. The water molecule clusters are aligned and smaller in size, making them easier to be absorbed by human skin cells. iSpring can also give instant alleviation on allergic skin such as Acne and Eczema. Directly spray on the affected skin surface and rub, iSpring will fully penetrate through Dermis in seconds and relieve the itchy, dry and irritated symptoms. iSpring is completely natural and is made with 100% pure energized protonic water. It is free from mineral oils, fragrances, synthetic chemicals, parabens, preservatives and any other harmful substances. 1.6 " x 6.1 "
iSpring is enabled by Pico Technology.